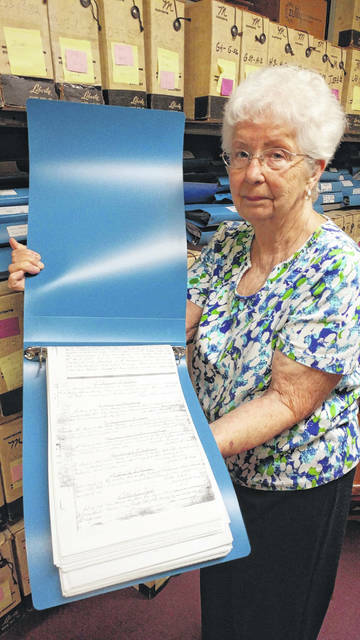 Marian Schoonover displays some of the Gallia Genealogical Society’s records. Ann Brown and Carolyn Cogar discuss books documenting Gallia history as Cogar sifts through records. GALLIPOLIS — The Gallia Genealogical Society continues on with its mission of recording the lives of Gallia residents, researching ancestry and more after the passing of one of its former presidents, Henny Evans, last November. Members of the society say Evans is missed, but they think she would be proud of the society’s recent accomplishments at 459 Second Avenue. The society brought home a pair of awards in spring for research in the form of published books. “Pioneer Patriots” by Anna Simmerman with the Gallia County Chapter of the Ohio Genealogical Society was recognized with the Salmon P. Chase Award for Abstracts of Ohio Records. Also, “Civil War Soldiers” and Carolyn Cogar were recognized with the Oliver Hazard Perry Award for Ohio related Military Historical Record. The society held its first meeting in 1983. According to Society Vice President Marian Schoonover, the organization has marriage records dating back to 1803 as well as will and estate records, some of the earliest in Gallia history. Among some of its unique records include ledgers detailing financial transactions for bounties on wolf skins from the early 1800s. As its name implies, the society assists individuals in researching their family history while cataloguing Gallia records. If one has a documented ancestor in Gallia by December 31, 1820, they are considered among the “First Families” of Gallia as part of a lineage society. If an ancestor can be proven to have resided in Gallia between January 1, 1821 and December 31, 1860, they are considered among the “Settlers and Builders” of Gallia. Ancestors or collateral relatives serving in the Civil War who lived or served in Gallia are considered among the “Civil War Families” of Gallia. If a family can prove an ancestor lived in Gallia between January 1, 1861 a hundred years prior to an individual’s application date seeking membership in the lineage society, they are considered of the “Century Families” of Gallia. For more information, visit www.galliagenealogy.org. 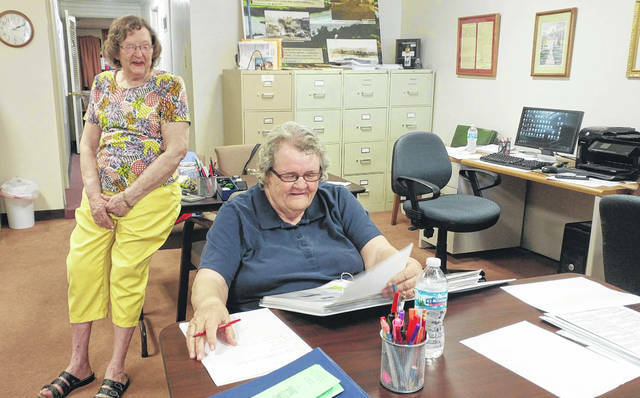 https://www.mydailytribune.com/wp-content/uploads/sites/42/2018/07/web1_0627181343.jpgMarian Schoonover displays some of the Gallia Genealogical Society’s records. https://www.mydailytribune.com/wp-content/uploads/sites/42/2018/07/web1_0627181411.jpgAnn Brown and Carolyn Cogar discuss books documenting Gallia history as Cogar sifts through records.